NASA's MAVEN spacecraft braked into orbit around Mars on Sunday after a 10-month interplanetary cruise from Earth, positioning the probe to help scientists learn how water and air were stripped from the red planet's ancient atmosphere, killing off life that may have once existed there. Reaching its destination after a 10-month voyage spanning 442 million miles since its launch Nov. 18, 2013, aboard a United Launch Alliance Atlas 5 rocket, MAVEN lit six rocket thrusters to slow down the spacecraft by about 2,750 mph, enough for Martian gravity to capture MAVEN in a 35-hour-long orbit. Confirmation of a successful orbit insertion burn came at 10:25 p.m. EDT (0225 GMT) after a nail-biting 34-minute maneuver that kept engineers staring at data screens inside a control center at MAVEN contractor Lockheed Martin's facility in Denver. "Based on observed navigation data, congratulations!" said Dave Folta, a MAVEN navigation engineer. "MAVEN is now in Mars orbit." 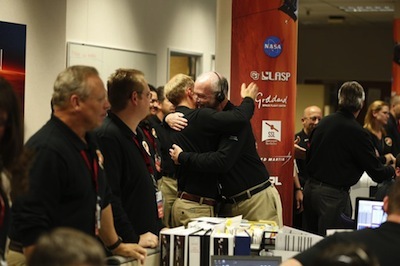 The announcement erased the tension in the MAVEN control room as the team broke out into applause and exchanged congratulatory handshakes. "We often talk about how Mars is hard," said John Grunsfeld, head of NASA's science mission directorate. "And once again, this team made it look easy, but it certainly wasn't. It represents many years of very complex work." The $671 million Mars Atmosphere and Volatile Evolution mission carries sensors to sniff the wispy air at the top of the Martian atmosphere, collecting data researchers will use to look back in time and figure out how Mars transformed from a habitable world to a barren planet void of any detectable life. "The MAVEN mission is about understanding the history of the climate on Mars," said Bruce Jakosky, the mission's chief scientist from the University of Colorado at Boulder's Laboratory for Atmospheric and Space Physics. "We're going to be exploring an aspect of the Martian atmosphere and upper atmosphere that really has not been explored in detail by any spacecraft to date." Before MAVEN could address the questions posed by Jakosky's science team, the school bus-sized spacecraft had one shot Sunday to be captured in orbit around Mars. The spacecraft was programmed to ignite its rocket thrusters at 9:37 p.m. EDT (0137 GMT). But ground controllers could not confirm the success of the crucial make-or-break rocket firing for more than 12 minutes, as telemetry from MAVEN beamed across the solar system at the speed of light, spanning nearly 140 million miles separating Earth and Mars. Sunday's rocket burn was supposed to place MAVEN in an orbit with a high point of 27,700 miles and a low point of 236 miles. David Mitchell, MAVEN's project manager from NASA's Goddard Space Flight Center, said Sunday night's Mars orbit insertion burn was right on the money. "You get one shot with Mars orbit insertion, and MAVEN nailed it tonight," Mitchell said. MAVEN's braking burn to enter Mars orbit lasted 34 minutes and 26 seconds, according to Mitchell. "That was about 11 seconds longer than the nominal, which really means we nailed it," Mitchell said. "Tracking data indicates we're in a stable capture orbit," he said. "The orbit period is near the target of 35 hours." A series of smaller maneuvers were planned over the next six weeks to transfer MAVEN into a lower, less elliptical orbit around Mars. By early November, MAVEN should be in its operational orbit ranging between 93 miles and 3,860 miles above Mars. While MAVEN lowers its altitude, ground controllers will put the spacecraft's suite of science instruments through testing and take advantage of a fortuitous flyby of Mars by comet C/2013 A1 Siding Spring on Oct. 19. 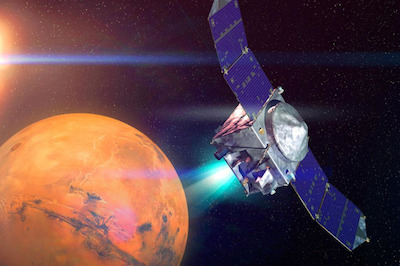 Working in concert with other missions at Mars, MAVEN will directly observe Siding Spring and gauge the Martian atmosphere's response to dust and gas spewed off by the comet. Jakosky said the comet encounter is an opportunity for bonus science, but MAVEN will be flying on the opposite side of Mars from the comet during its closest approach, using the planet as a shield from an unpredictable cloud of material that could be in Siding Spring's tail. "We should learn a lot about the upper atmosphere from the this natural experiment watching the perturbation from the impact of gas and dust, and we're hoping to learn about the comet as well," Jakosky said. Once the comet passes Mars and MAVEN reaches its science orbit, the mission will turn to its primary purpose of investigating an ancient shift in Martian climate that dried up riverbeds, thinned out the red planet's atmosphere, and may have doomed Martian life -- if it existed. "The evidence shows that the Mars atmosphere today is a cold, dry environment, one where liquid water really can't exist in a stable state," Jakosky said. "But it also tells us when we look at older surfaces that the ancient surfaces had liquid water flowing over it, and we see evidence for lakes -- for river channels -- a lot of evidence of liquid water that required a very different climate than the one we have today." Five times during its one-year prime mission, MAVEN will alter its orbit to dip deeper into the wispy layers of gas enshrouding Mars, plowing through the atmosphere just 77 miles above the red planet. "If you put your hand while you're going through, you would feel a light breeze," said Guy Beutelschies, MAVEN program manager at Lockheed Martin Corp. "It's really a modest amount of pressure out there, but it is a tremendous value for the scientists to be able to go down and get that in situ measurement of the atmosphere." MAVEN's solar panels are canted at an angle on each end, making the spacecraft more aerodynamic when it flies through the outer atmosphere of Mars, according Beutelschies. The spacecraft is outfitted with instrumentation to keep track of solar activity, measure the make-up of the Martian upper atmosphere, and observe how the atmosphere moves, grows and shrinks during the mission. NASA has committed to paying for MAVEN to collect scientific data for at least one year - until late 2015 - but the platform has enough fuel to last up to a decade. One of MAVEN's ancillary objectives is to serve as a communications relay platform for NASA's rovers on the surface of Mars. The space agency relies on orbiters above Mars to function as faster radio links with the rovers than if engineers were forced to communicate with them directly. MAVEN's relay radio will be tested in November during a communications link-up with the Curiosity rover. But research is the reason for MAVEN's existence. Scientists know Mars today is a barren world with its water locked up in underground aquifers or in immense polar ice caps. Thanks to missions like the Curiosity and Opportunity rovers, geologists have obtained a window into the Martian environment billions of years ago, when Mars had ample flowing water and all the chemical ingredients required to give rise to life. Data from previous missions lack insight into how and when Mars changed, and MAVEN's job is to find out what triggered the dramatic climate shift. "What that leads us to ask is where did the water go? Where did the CO2 (carbon dioxide) go from that early environment," Jakosky said. "It can go to two places. It can go down into the crust, or it can go up to the top of the atmosphere where it can be lost to space. What we're going to be doing is studying the top of the atmosphere as a way of understanding the extent to which stripping of gas out of the atmosphere to space may have been the driving mechanism behind climate change." MAVEN joins NASA's two other operational Mars orbiters at the red planet -- the Mars Reconnaissance Orbiter and Mars Odyssey -- along with the European Space Agency's Mars Express spacecraft. With NASA's Curiosity and Opportunity rovers crawling around the Martian surface, the arrival of MAVEN will put the number of operational Mars missions at six. The number won't stay there for long. India's first interplanetary spacecraft, the Mars Orbiter Mission, is scheduled fly into orbit around the red planet Wednesday.